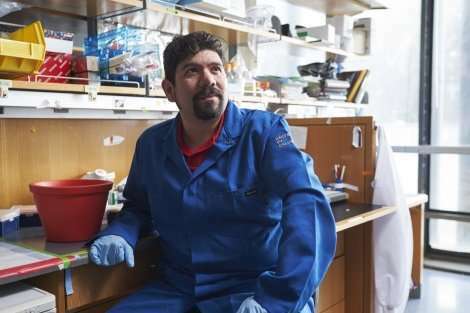 The study, published online February 20, 2018, in Cell Reports, was conducted by the UCSF lab of Saul Villeda, Ph.D., an assistant professor of anatomy and member of the Eli and Edythe Broad Center of Regeneration Medicine and Stem Cell Research at UCSF. Using a technique called parabiosis, in which the vascular systems of two mice are surgically connected, Villeda's lab had previously discovered that infusing old mice with the blood of younger mice leads to brain rejuvenation, including improvements in learning and memory, while infusions of old blood cause premature brain aging in young mice. The lab has since been searching for the specific biological molecules in the blood and the brain that confer the benefits of youth or the impairments of aging. Geraldine Gontier, Ph.D., a postdoctoral researcher in the lab, recently discovered that infusions of young blood made a molecule called Tet2 go up in a part of the brain involved in learning and memory called the hippocampus, suggesting that Tet2 might be a good candidate for a molecule driving the cognitive benefits of young blood. "At first I didn't believe it," Gontier said. "I did the experiment again and again to make sure that it was right. But it became clear that some circulating factor in the blood is able to change the level of Tet2 in the brain." Tet2 is a type of cellular enzyme known as an epigenetic regulator—responsible for making specific chemical annotations to regions of DNA that alter the activity of many different genes. Recent genetic research in humans has implicated mutations in the gene for Tet2 as a risk factor for many different diseases of aging, including cancer, cardiovascular disease, and stroke. Gontier and colleagues found that as mice age, Tet2 levels in the hippocampus decline, as do the epigenetic tags Tet2 makes on DNA. Among the genes that lost these tags with age were those associated with neurogenesis—the ability to produce new brain cells during adulthood—a process which also declines with age in the mouse hippocampus. Looking more closely at this decline, Villeda's team found that it closely paralleled the age-related loss of Tet2 expression. Earlier work in Villeda's lab using parabiosis showed that infusing old mice with the blood of younger mice led to brain rejuvenation. Credit: Villeda lab. To find out if the loss of Tet2 in aging could directly cause cognitive decline, the researchers used a technique called RNAi to block Tet2 activity in the hippocampi of young adult mice. They found that the reduction of Tet2 significantly reduced the birth of new neurons, and also caused animals to perform significantly worse—more like aged mice—on tests of learning and memory such as remembering the location of a submerged platform in a water maze. The birth of new neurons in the mouse hippocampus starts waning in early adulthood—well before cognitive decline becomes obvious—so the researchers wondered whether boosting Tet2 levels in the adult hippocampus could restore neurogenesis and potentially prevent the onset of cognitive decline later in life. "This was amazing because it's like improving memory in a healthy, 30-year-old human," Villeda said. "I always assumed that because there are no overt cognitive impairments in middle-aged mice, we wouldn't be able to improve their brain function, but here we see that, no, you can improve cognition to make it better than normal." "This finding is exciting on many levels," Gontier added. "I've spent my entire Ph.D. and now my postdoc trying to understand how the brain ages and how can we reverse it. And in this study, we find that one molecule, Tet2, is able to rescue regenerative decline and enhance some cognitive functions in the adult mouse brain." It's not yet clear exactly how Tet2 levels drive improved learning and memory in the mouse brain, or whether these improvements will translate to humans, Villeda cautions. For example, the existence of adult neurogenesis in humans is still controversial, suggesting that the same benefits seen in mice may not be possible in humans. However, Villeda says that he believes neurogenesis is just one aspect of the brain's regenerative abilities, and probably not the only one being impacted by altering Tet2 levels. "In our study we found that removing Tet2 from the hippocampal stem cells that give birth to new neurons caused some cognitive impairment, but removing it from the whole hippocampus caused even more. That suggests that this is about more than just stem cells. This molecule is driving changes throughout the whole brain structure." Villeda said. "I think of neurogenesis as a signpost of regeneration in the brain, but ultimately I think that it's changes to the neurons themselves—preventing synapse loss, boosting plasticity—that are going to improve cognition. One of our next big steps is to catalogue exactly what's happening, both at a genetic level and at a neural level, in mice who've had this treatment."